I’ve just got back from a week’s vacation in deepest darkest North Wales, the part where they speak Welsh as their first language and English second. I love to hear Welsh spoken. Can’t understand a word, well maybe the odd one, but I’ve never found it a problem yet. Anyway to this weeks challenge and I must say I’m struggling with this one. Trying to find some photographs that fits the theme OFF SEASON is proving hard. But searching through my back catalogue I finally found something, I hope. What I find interesting about this photograph is that in our ever-increasing “elfin safety” environment there looks like a decided lack of it here. Maybe to get the job done properly they have decided to work without safety belts, hard hats etc. Sorry this is a short one but I hope you enjoy the photograph. Here’s what others are saying about this weeks challenge. 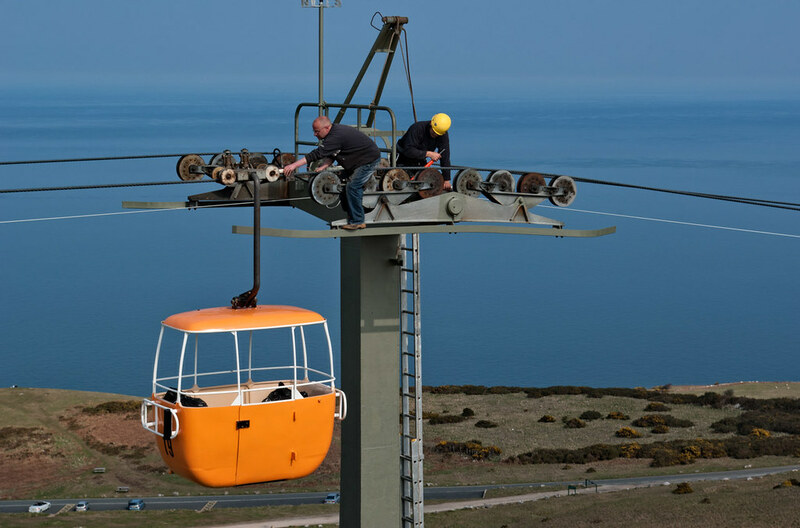 That’s looks awfully precarious and I can not imagine working in those conditions with no safety harness but I suppose those guys were accustomed to the work “in the sky.” Glad you visited northern Wales so I’m expecting to see some great photos of your vacation. Did you see any of those great Border Collies that are extremely well bred for sheep herding? Some American breeders get their breeding stock from Wales and also from Ireland. The dogs are marvelous with wonderful temperament. I live in the North East part of Wales, not too far from the border with England, Yvonne. Not that you would notice any borders as we are all part of the United Kingdom. In our part of North Wales English is the predominant language with very few Welsh speakers. Go twenty miles inland and it starts to change with more people speaking Welsh. Down at Harlech and especially on the Llyn Peninsula it’s the other way round. Welsh is the predominant language with English second. But because these areas are visited by tourists more often than not you will hear English being spoken. Go off the beaten track and it’s Welsh. Most of the farms round here use Border Collies, they are the natural choice for sheep farmers and goodness knows we have lots of sheep here, even where I live. I live right on the outskirts of town, five minutes from my house you are out in the country and the farms around here are mostly dedicated to sheep farming. Go into Snowdonia, where I do most of my photography, and there’s where you see most sheep. Even on the coast we have sheep and it is often said that the meat from coastal Welsh Lamb tastes different from that of the mountains. Thank you Mike for the info. You will have to get some shots of the sheep farmers and the Border Collies. I would love to see photos of how the rural people live and the dogs that work for them.